If this email doesn't seem to be displaying properly please access it online by clicking here. You have received this message because you have opted-in to receive emails from The Center for Health Design, or attended one of our conferences. Each year at Healthcare Design Expo & Conference, we get together at our VIP reception with top industry professionals and organizations who are a part of our CHD Affiliate and this year, our new Affiliate+ member community. These members meet not only at this annual event, but also throughout the year as our guests at regional networking receptions, that include one hour CEU sessions. Members also enjoy discounts on most CHD products and educational tools. Want to become a part of this prestigious community who is fostering the EBD movement and advancing our work through their support? It's easy - contact Callie Unruh to learn of membership options and decide which is best for you. 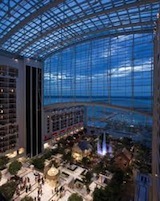 All members receive an invitation to join us in Washington DC at our VIP reception at Healthcare Design Expo & Conference. Questions about Affiliate or Affiliate+ membership? Contact Callie Unruh, Membership and Development Manager at 925.521.9404, ext. 121 or cunruh@healthdesign.org. Attend one or both of the Healthcare Design pre-conference workshops listed below and get the knowledge and tools needed to address some of the cost and outcome challenges facing healthcare today. The Coaching Workshop, Practical Application of Evidence-Based Design (8:30 am – 2:30 pm), is an excellent opportunity to bring EBD concepts into practice, offering an opportunity to get personal consultation about how to integrate the EBD process into your project(s). ​"I found this inspiring, really exciting, I had no idea that there was this intelligent thoughtful and really amazing group supported by tons of research - a fantastic group of people and wonderful references." (3:15 p.m. – 5:15 p.m.), is a comprehensive study session to help prepare for the EDAC exam by offering general information about the exam, the types of questions on the exam, a detailed review of the three study guides, an overview of the five domains included on the Exam Content Outline, a summary of key concepts and time for Q&A. Designed, organized and improved to help you find and use the resources you need. We’re creating, curating and providing easy access to the next generation of healthcare design information, tools and resources to empower you and your team to make even greater strides in improving healthcare through the design of the built environment. This new website filled with expert interviews, issue briefs, case studies, design strategies, webinars and more will not only enhance your ability to improve the lives of patients, their families and their caregivers; it will equip you to help solve today’s most pressing healthcare issues – improving health outcomes and reducing healthcare costs. April 9 - 12, 2016 at the Austin Convention Center, Austin, TX. During this three-day learning experience, attendees will network with peers while learning the latest innovations and best practices in the design of long-term and residential care settings. More information coming soon. Three 30+ minute videos -a comprehensive review of the EDAC Study Guides, exam format, types of questions and exam prep tips. More information found here. 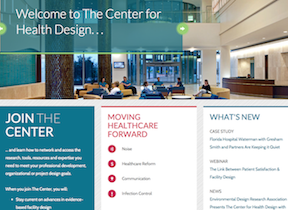 The Center for Health Design is a nonprofit 501c(3) whose mission is to transform healthcare environments for a healthier, safer world through design research, education and advocacy. Looking for ways to support our work? Become EDAC Certified, Join our Community of Affiliates; Become a Pebble Partner; Add to our Knowledge Repository; Donations make a difference; Watch our on demand webinars; Ask us about volunteer opportunities. Like us on Facebook; Contact us. To forward this mailing to friends or colleagues, click here. To unsubscribe from this mailing, click here. To resubscribe to this mailing, click here. To opt-out of all future mailings from us, click here.